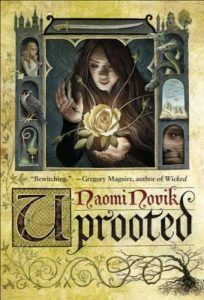 It’s been a while since I’ve reviewed a book, but, after reading Uprooted, I feel compelled to note just how much I loved it. Although Novik may be known for her Temeraire series, I fully expect that Uprooted will be considered her masterwork. I don’t want to dive too deep here so I’ll simply say that Uprooted is a great story with excellent characters. The world (at least what we know of it) is quite small, but its intimacy works quite well. Agnieszka is simply an amazingly rich character, one that I won’t soon forget. She is smart and compassionate and very feisty. And The Dragon is her nearly her exact opposite. In a way, Uprooted is a simple story, but it’s told in such a rich way… I can’t adequately describe why I liked the novel so much, but I did and I would recommend it almost anyone, fantasy reader or not. I ended up reading this because it was included in the Hugo voter’s packet (technically, a sample was included but you could get the full version for free by emailing Random House, which I did) and I had heard so many good things that I decided I should read it before I voted. Although I really liked N.K. Jemisin’s novel, I ended up ranking it as #2 on my ballot and ranked Uprooted as #1 because it was just that good. I hope it wins, but I would be just as happy if Jemisin wins. I’m sure all of the novels are worthy, but those are those are the only two from the ballot that I read.